Goede Lucht is a private primary school located in a neighbourhood in Anderlecht, Brussels, and is integrated with the local population. In addition to the curricular activities, organizes programs and events based on popular games where children are the protagonists. 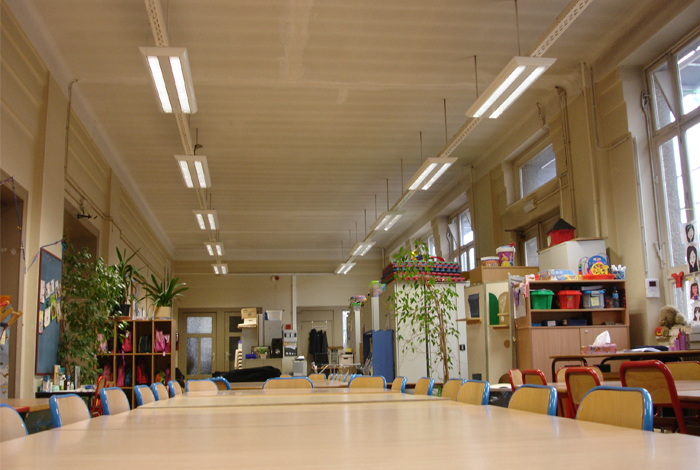 The lighting of the school has recently renovated considering the sustainability values. The lighting design for the Goede Lucht, contemplated Indelague products designed for energy saving so the luminaries ST-ANS 228 PBB and ET-LNE 414 PSB are the best solution. The luminaries ST-ANS 228 PBB was applied in work rooms and has a light sensor so there is no wasted energy, the light fixture connects only when the natural light is below what is considered normal. For ET-LNE 414 PSB is a high performance luminaries with application in offices and corridors.